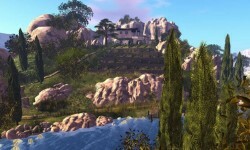 Chakryn Forest is a romantic hideaway filled with dense trees and secret locations. What will you find hidden amidst the shadows and light? Woods Of Marathon Caye provide a lush wooded environment filled with activities for visitors, including two live entertainment venues, a windmill with table games and many touring choices (rowboats, canoes, kayaks and horses). There are also zip lines for a thrilling view. Angel Manor Gardens is the public garden and part of Angel Manor Estate. It is a beautiful place for all come to and relax. Enjoy time with friends and loved ones or the amazing power of nature to calm the soul. 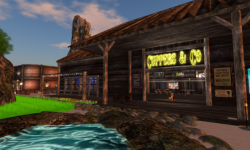 Cuppers & Co. is a great hangout and party place in Second Life. Founded in October of 2008, it originally started out with just a few games, but has now grown to over a quarter sim with places to hang out, fun group games as well as also Coffee Cuppers bar and all purpose party platform. The Bay City Arboretum of Rather Atypical Vegetation hosts a seasonally-changing selection of unusual flora from the world famous Flux Collection. Lovingly cared for by Zyx Flux, chief gardener, please keep all appendages away from the specimens. The dawn has come and the wine will run....and the song must be sung and the flowers are melting in the sun. Fire Beach aims to be a safe place to hang out and meet people from all over the world. 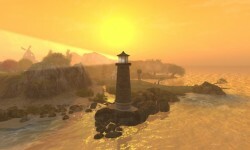 There are plenty of places to explore, including a romantic beach, magic forest, lava pit, and shopping area. 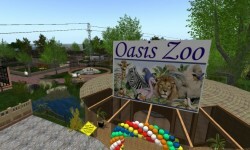 This walk-through zoo displays animals and enables people to see firsthand how animals live and interact with each other. There is a wide variety of mammals, reptiles and birds. Bring the kids and grab a free balloon, it's time for a trip to the zoo! 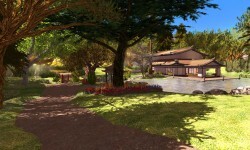 Alethia Island is a tropical sandbox resort offering a peaceful and scenic experience for everybody. Discover the overgrown pathways, secluded chillout spots and many fun photo opportunities that gives the island unique charm and character.